It was actually not easy finding a decent restaurant in the vicinity of our hotel, but thanks to a recommendation by the front desk we found ourselves at Ristorante Mimi located not too far away. Surprisingly there were quite a number of Japanese diners that evening, though most of them looked like seasoned expatriates given the way they were conversing in fluent Italian with the waiters. The travel buddy would always let me have a first bite of the bread before he makes for it. Most of the time, I would end up giving a very tired and resigned look because of how hard or tough the bread is, and it would normally end up with a small round of amused laughter. It was no different this time round. I'm thinking Italian elders must have very good teeth, or dentures. The Cotoletta alla Milanese was a splendid breaded veal cutlet that was sautéed in butter and cooked to a pleasant golden brown. It may not be the most filling dish but at least it was satisfying. James was still trying to find a better Bolognese Pasta, but alas it wasn't to be found here in Naples. This one was decent but not impressive for sure. I picked this off the dessert bar and was glad I did. 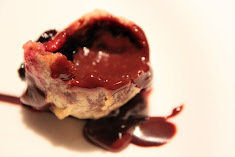 They would reheat the cake so that the chocolate lava in it would be nicely hot and flowing. It's very thick chocolate mind you, so it didn't flow as quickly, but it's good quality chocolate that set me on a chocolate high for the night. The Palazzo Caracciolo Hotel is one of the best hotels that Naples has to offer, and if you need a bit more persuasion, well, it's a refurbished palace that was not only home to the ancient Caracciolo dynasty, but also to Gioacchino Murat, a King of Naples. Of course, don't expect gold furnitures all around, since the new hotel prides itself on its contemporary and elegant touch. For just €5, this was really quite a steal. The Cheeseburger is simple but one of the best that I've tasted. I can't decide if the patty was minced or hand-pounded (or even, both) but I what I do know is that it was really fresh, tender and delicious. The buns were well-toasted and the fries arrived piping hot. Ah, yummy. My friend thought his Ham and Cheese Sandwich, Caracciolo-style, was just about alright without being anything impressive. I think he prefers his American-style Ham and Cheese, even if it looks more boring aesthetically. €5 each, but a room surcharge of €5 is imposed. Make the most of it and order drinks. If you're eager to try out the street food in Naples, but don't know where and how, here's a good place to start. 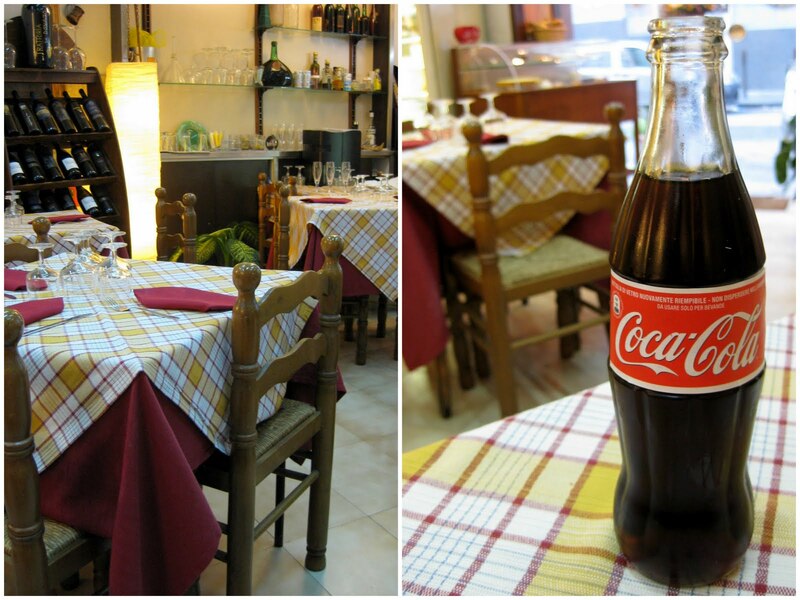 Il Pizzaiolo Del Presidente, just a minute walk away from the Duomo di Napoli, is a favourite amongst locals. If you're curious, its current name is actually a proud celebration of a golden moment in 1994, when owner Ernesto Cacialli earnestly pulled then US President Bill Clinton into his shop for some pizzas! Il Pizzaiolo Del Presidente is not only known for its crisp and piping hot pizzas fresh from its wood-fired oven, but also for its fried snacks like the zeppole (deep-fried dough balls with fillings like custard) and mozzarella croquettes. A friggitoria is actually a shop selling fried food, so Del Presidente is a nice mix of a pizzeria and a friggitoria, great for any brunch or teatime indulgence. Picture taken with the Canon EOS 500D. 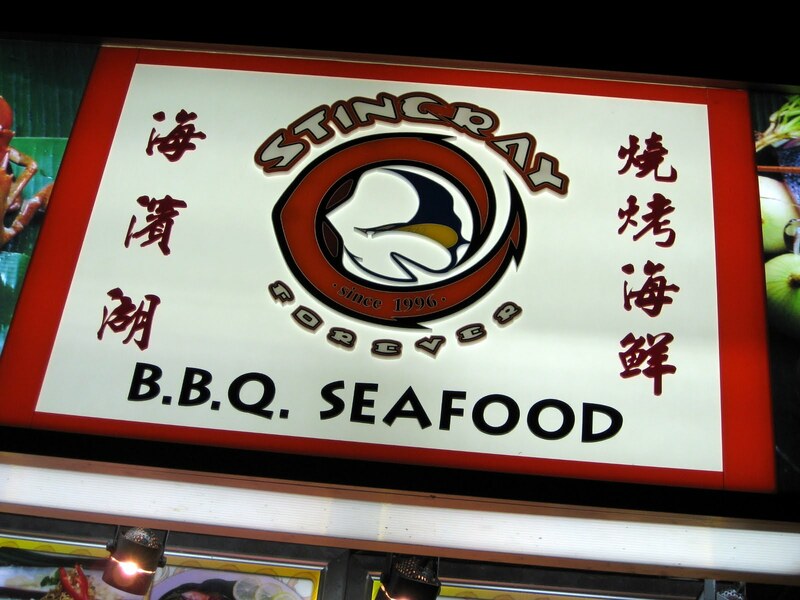 When many of us are travelling overseas we often have this curiosity in us on how the street food will taste like, knowing that that's really where the "real deal" would probably be, not those more uptight eateries we call restaurants. Travelling in Naples was like that as well, especially since it's so well-known for pizza that you'd expect it to taste good anywhere and everywhere, much like the gelato in Florence. Still, always be prepared for hits and misses when it comes to food, no matter where you are. Ciao Pizza is a small chain of pizzeria stalls dotted around Naples and should not be confused with restaurants of similar names in Australia or the US. Looking at the nice variety of pizzas on display, you can't help but want to try one even if you're on your way to dinner just 100m away. When on holiday, throw that diet out of the window. Naples is undisputedly the birthplace of the pizza, and if you're in Naples and you don't get a slice or two of its famed food you're better off just shooting yourself. For first-time visitors to Naples me and my friend had really little idea of where to go for a good pizza, and so we consulted Tripadvisor.com and decided on Restaurant #1: Ristorante Pizzeria Da Donato. When I say Pizzeria Da Donato is a humble eatery, it really is, not only because of the simple and slightly old furniture and interior but also the fact that there's only two menus in the house. Famished as we were, we waited impatiently as a Chinese couple poured leisurely through their menus, and then ordered as fast as we could once we knew what was on offer. In most restaurants in Italy, bread does not come complimentary. Here, these few pieces of cold and very tough bread came up to €2 and was something we didn't quite touch after a couple of tired bites. Hands-down one of the best and most authentic pizzas we had in Italy. We actually ordered this as an appetiser to share, and I suggested we test the pizza out at its most basic. Authentic wood-fired pizza at its best, thin on most parts and fluffy where necessary. Worth the price too since it's slightly over 10inches. Delicious. My Ragu Neapolitan pasta tasted better than it looked, and had a good measure of al dente cooking that kept it firm to the bite. The ragu was a very good and hearty meat sauce, though I wished there was more! James, the Italy travel buddy, wasn't all too impressed with his Carbonara pasta though, but he reminded me to add in this post that he has never been much of a fan of carbonara anyway! He was forced to choose this because there weren't that much meat options available for the day. He made his pasta more bearable by stealing some of my ragu sauce, which I was happy to share since it was quite good. Warm and friendly, but there was quite a bit of a language barrier. We tried our best and it came out alright. Flying with Emirates was a pleasant experience. The food was good, the service was good, the seats were comfortable and the in-flight entertainment was not too bad. For long-haul flights, be prepared for a stopover at Dubai International Airport, which to me is actually a good thing since I get to stretch my legs and do some shopping and eating. The airport is pretty new and definitely has a modern feel and touch to it, and on second thoughts a lot of it actually resembles Changi Airport's Terminal 3. There's a splendid array of cakes, tarts, pastries and sandwiches indeed, and for that moment I wished I wasn't travelling alone because then I would have had the excuse of ordering more. Since I wanted my trip to get off on a sweet note, I decided on a "safe" choice - the chocolate tart. 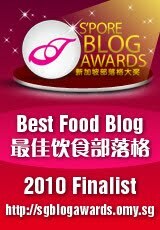 It gives me great pleasure to share the good news that The Simplest Aphrodisiac has just been selected as one of the top ten finalists for the Best Food Blog category in the Singapore Blog Awards 2010. This is a blog contest that is being organised by omy.sg from the Singapore Press Holdings, and my thanks must go to Choong Chiat who was the first to nominate me for the award from the very start. It is indeed flattering to know that the judges recognise the efforts that I've put in for this blog, and while it has never been for fame (it still isn't), such marks of recognition is greatly appreciated. Of course, I don't fancy my chances all too much, especially since omy.sg is a bilingual agency after all and all I can offer is a good command of the English language. What me and SPH have in common, and apart from a couple of the other finalists, is that I've followed the practice of long-time food critic Wong Ah Yoke by paying for my own meals and not peppering my blog with free food tasting sessions. This way, I've felt that I could write with much more honesty, sincerity and accuracy, as well as being able to gauge the worth or value of the dishes. So, if you've been reading this blog, and if you like what you've been seeing and reading, show me some love and vote for me please! If anything I think the trip to Hong Kong and/or Phuket is more enticing than the "status" itself haha! Just head on to the Best Food Blog category, register as an omy.sg member (one-time registration, tedious I know!) and click on the tiny "vote" banner on my picture on the left hand column. You get to vote only once per day, so the next time you're voting just click the banner and a login window will automatically pop-up. Easy peasy. Last but definitely not least, a big thank you to everyone for your amazing support! Keep reading, keep eating and keep living life! I heard about the good and very affordable food from Jai Thai from a few bloggers and have been wanting to try it for quite some time. I finally did, a full two months plus after trying to find time amidst my busy schedule, but it was worth the wait I guess. While the food is not exactly "wow-impressive" and may not eclipse that of my favourite Ah Loy Thai, the dishes do have a home-cooked feel surrounding them which I quite like. It's also "no pork, no lard" here at Jai Thai. The family was having ala carte dishes with steamed rice, but I thought we could order a main to share as well. The Fried Tang Hoon was quite delicious despite the lack of ingredients, and had an adequate amount of sweetness to it. There wasn't any sambal kangkong, so we'd make do with this. Fresh greens stir-fried with oyster sauce. It's alright. I thought this was the best dish of the night. The Beef Green Curry tasted very authentic with the slight hint of spiciness but also with the sweetness characteristic of a green curry. This has given me reason to return again and to try the more Thai-based dishes like phad thai and tom yum soup. My sisters' favourite, deep-fried chicken chunks wrapped in pandan leaves for the little added aroma and flavour. The chicken pieces here are slightly bigger than those that you may find elsewhere. Blame my sister for being so boring by ordering yet another chicken dish. It's quite sweet and I ended up liking this much more than her because of the crispy chicken pieces. Nothing much to this dish, the flavour of the fish was overwhelmed by the batter and the sweet sauce. Not the biggest of portions but at least the prawns were sizeable. Not too bad. Seemingly slow service with only two waiters on a Friday night. The place was packed and families tend to laze around their tables and pretending not to see the long queue outside. As such, reservations are a must. I must add that the waiters, while attending to you, are pretty friendly and polite. Relatively near Bishan Junction 8 and MRT. The weekend is here again and I know many of you working people are walking about with a wider smile on your face and with an extra bounce in your step. I guess I will know how it really feels like (sans my experience in various internships) once I start work on... 1 June! Served with sambal chilli and mayo. Finding those pearls under the shells. A personal favourite, dip it with deep-fried mantou buns! For that extra spicy zest... yum! My recommended (no pork, no lard) stall is situated close to Stall 40, Lagoon Carrot Cake, another great stall with delicious carrot cake! Ebisboshi Shotengai at Iluma Bugis is a Japanese restaurant that features a combined menu from seven separate Japanese dining brands. It's relatively quiet most of the time (as it is for the entire Iluma shopping mall) but I think the food here is more decent than what many other people would otherwise think. Then again, I'm willing to admit that I don't have the most refined of tastebuds and neither am I very picky or selective about my food. Nevertheless, Ebisboshi Shotengai remains one of the better eateries within Iluma and is worth a try. I've ordered this at least twice on last count, not so much for the chicken karaage (which you could actually get from major supermarkets) but for the really crispy and juicy deep-fried tempura prawns that are simply a delight to munch and chew on. The soft (but usually cold) tofu meanwhilegives you the pretense of a "balanced", which I appreciate very much. Rice was served warm and sticky as Japanese rice should be, and the addition of a few shreds of fried egg is a nice gesture. The Beef Yakiudon was decent, but the surprisingly good thing about this dish was the tenderly good slices of grilled beef. The middle term somehow always manages to crack me and my guy buddies up. We're still child-like I know. Overall another "okay" dish with a decently pleasant soup base. Good. Free flow hot/iced green tea for a nominal fee. Iluma @ Bugis, Level Four. I always like a good brunch, and I always like a good burger. It's not often that you can get the both of them so nicely together, and the experiences at Spruce and Riders Cafe too didn't seem to make the mark, or my expectations for that matter. In steps PS Cafe, admittedly a slightly more upmarket eatery as compared to the two, but nevertheless, this is one place that could put it through confidently - it can be done. The interior of the Palais branch of PS Cafe is chic, warm and pleasant. It's the sort that entices you to order almost everything on the menu and to get you to want to laze and wile the whole weekend morning and afternoon away. Choose from a selection of "brunch specials" on the big board in front, or take your pick from their main ala carte menu. Portions here are relatively big, so be prepared to loosen that belt if you're aiming for PS Cafe's popular desserts as well. Else, don't be greedy and share! The PS Cafe Home Brew Tea was really strong and bitter, but it warms your heart and soul and is a great refresher for the morning. There's always Caffe Latte if you want something sweeter. Now now, this is a reallyyy good burger. It is quite pricey at close to $30, but for that price you're paying you'd be getting a thick, beefy and tender beef patty that screams quality at one of its finest - worth your buck for sure. Perfectly grilled with that hint of sauce and perhaps, even wine, and well complemented with that large onion ring and fried egg. It would be even richer with the bacon (no pork for me) but already this is quality (and most filling) stuff. I know some kids out there, often only on the hunt for free food sessions, eat few burgers and then wax lyrical of the small burgers at Smok'inn Frogz - but real men, real men eat good, thick and juicy burgers like this wagyu burger from PS Cafe. And that's it. Very good. I was surprised the waitress knelt on the floor beside me just to take our orders, and though a seemingly sincere gesture it is quite unnecessary. The king bids you to rise. About $30 for each main course. Orchard Palais Shopping Centre, Level 2. Opposite Forum The Shopping Mall / Beside Orchard Towers.